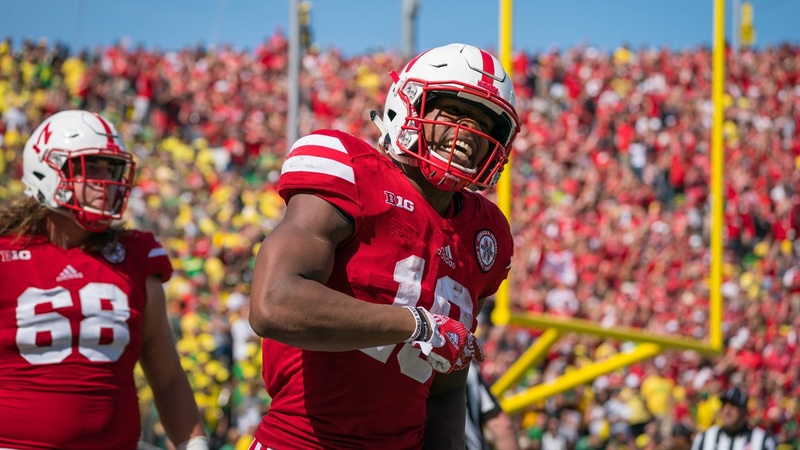 The words “if” and “doubt” aren’t in Tre Bryant’s vocabulary. There was never a question for him if he would come back and be able to contribute to Nebraska’s running back room. There was never a doubt he would be the same player as the guy who rumbled for 192 yards in the season-opener last season. He went down for good on Sept. 9 of last year, after 102 yards through three quarters against Oregon. He remembers the date well. He had surgery on his right knee in mid-October. When he met with the media on Wednesday — his first such availability in some time — he wasn’t interested in sharing too many details about what happened and when; just know Bryant wanted to ball and he was determined to not let that be taken from him. Bryant categorized last fall camp as being in “survival mode” before the season even started. “It was just kind of like let’s see how long we can ride this thing out so when I went down it wasn’t necessarily a shock,” he said. But he’s not in survival mode anymore. Now he's "full go." In the summertime, right on schedule, he went back to work. When he saw himself stride for stride with the other backs, making the same cuts, he knew things were back on track. He says he leaned on friends, family and the Husker training staff. Husker coaches have him operating by a new motto: smarter, not harder. He’s seen the other side of it now, so he’s not pushing when his body tells him to scale it back. Bryant says having been through a lost season and knowing that’s what awaits him if he continues to push past his limits is more comfortable. Continue to train smarter and he can play for longer. When the season begins, Bryant will be contending with junior college transfer Greg Bell, freshmen Maurice Washington and Miles Jones, seniors Devine Ozigbo and Mikale Wilbon, sophomore Jaylin Bradley and maybe even walk-on Wyatt Mazour if Wednesday’s open practice was any indication. That’s a lot of runners for a finite number of carries. Bryant says he likes the overstocked stable. Held didn’t watch much of last season, but he watched Bryant’s tape against Arkansas State. In that one game against a defense that ended the season 18th in stuff rate and 28th in defensive rushing success rate, Bryant ripped off 6.2 yards a carry. Fifty-one total carries obviously isn’t a great sample size to work with but on those carries, he averaged 5.9 yards a pop, which would have been eighth-best in the Big Ten. Among the 41 players in the conference to have at least 50 carries last season, though, only two of them had a better opportunity rate (picking up 5 yards when 5 yards are made available) than Bryant’s 49.0 percent. He’s not just another back to add depth, he’s a starting-caliber runner when healthy. “He has the ability to hit it downhill and even in camp when he runs it downhill the pile goes backwards towards the touchdown,” Held said. “He can get low, he’s very powerful, he’s a good kid and he’s smart. He’s kept up with the mental piece of it so I’m excited about what he can do.